Students of class X throughout the country vigorously participate in NTSE every year. National Talent Search Examination is a scholarship program of National level which purposes on identifying talented students and tapping their potential. Every year more than 50 lac students sit for this prestigious exam, and 2000 are given entitlement to scholarships for their further studies. If you are willing to appear for the upcoming NTSE and searching for some tips, then you are just at the right place. In this article, you will be learning about how to prepare for NTSE exam without Coaching. This can be done with ALLEN’s Study Material for NTSE. 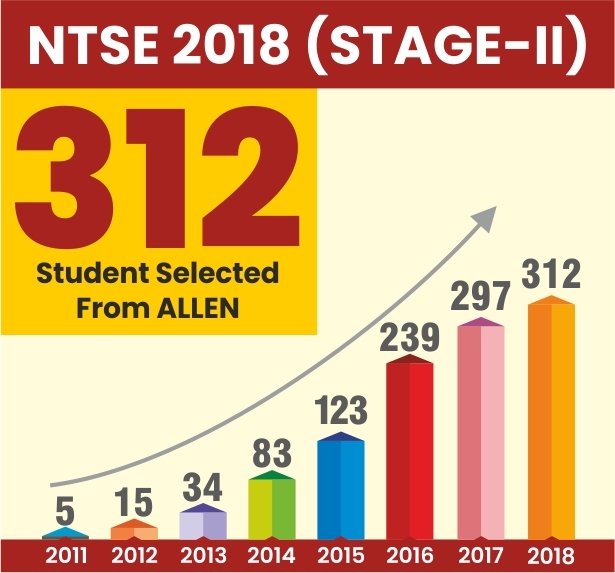 which are exclusively designed NTSE study material by most experienced ALLEN faculties for students who are preparing for NTSE Stage I and Stage II exams. This program covers the entire syllabus of NCERT and State boards curriculum which helps students who cannot attend and afford classroom courses. The whole curriculum is made keeping in mind the convenience of the students and is distinguished according to various levels of the exams. Students should emphasize on a particular topic and take tests according to their requirements. The major benefit of ALLEN study material is that student gets access to a well-prepared syllabus based on the exam pattern and precisely drafted test series which can help in evaluating students’ progress. Students targetting NTSE Stage 2 can avail the Online or Offline test series for better preparation. 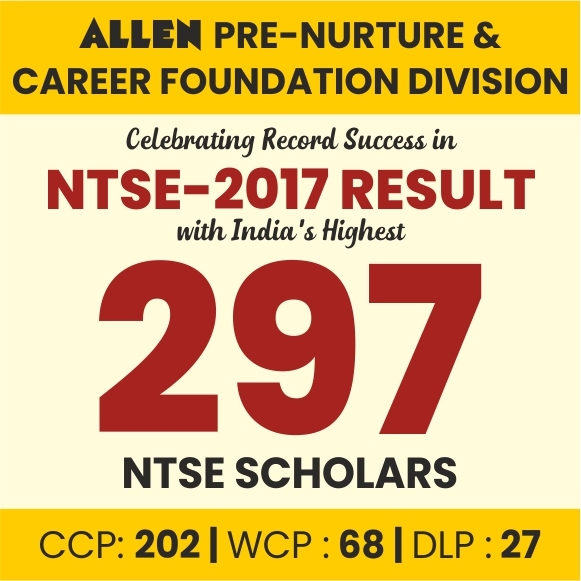 Preparation:- ALLEN Career Institute’s NTSE Study Material (Stage I & II) 2019 is prepared by most experienced ALLEN faculties which is reasonably comprehensive, researched and developed in a self-explanatory format for students. With an aim to provide students with a wonderful academic tool to polish up their NTSE 2019 preparation that helps them to become one of the scholars, we are offering an NTSE Study Material in book format. This study package is based on State Board & NCERT Curriculum. Set of state pattern NTSE papers for practice in Study Material. Complete syllabus of Stage-I & II both in a single set. State wise different study material for different states. National Talent Search Examination, conducted by the National Council of Educational Research and Training (NCERT), is one of the most prestigious competitive examinations in our country, for the students of High School level, which gives them a chance to showcase their high intellect and academic talent and earn scholarship rewarded by the Government of India. Two years Offline Test Series for class 9th and one year for class 10th. Rajasthan, West Bengal, Delhi, Haryana, Uttar Pradesh, Chhattisgarh, Odisha, Maharashtra, Gujarat, Chandigarh, Punjab, Madhya Pradesh, Karnataka & Jharkhand. Test papers will be based on NTSE Stage-I Pattern & Syllabus from their respective State Boards. This test has multiple-choice questions, where one alternative is correct. However, it can also have matching, arrange the sequence, true & false statements and questions based on passages. The idea is to assess the reasoning ability and logical thinking of the candidates. It has a variety of questions about analogies, classification, series, pattern perception, hidden figures, coding-decoding, block assembly, problem-solving, etc. Here, the goal is to gauge the power of reasoning, ability to judge, evaluate, visualize in space, spatial orientation, etc. of the candidates. ALLEN offers another alternative to students preparing for NTSE Stage 2 exam. 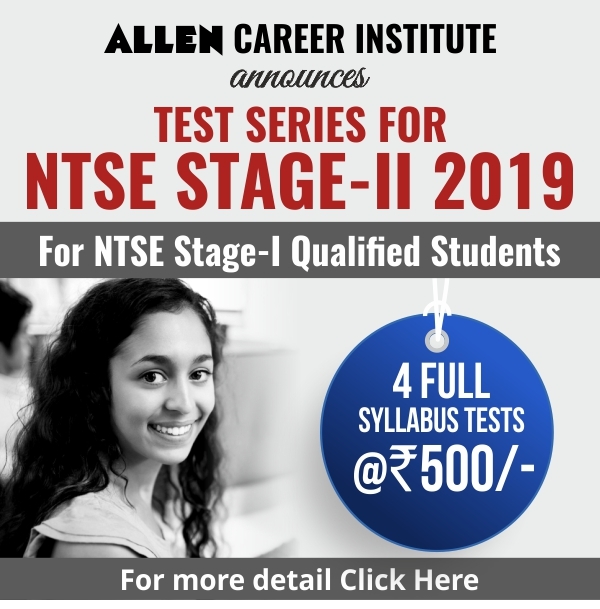 With an aim to provide aspirants with an insight about the NTSE aptitude test questions, and pattern, ALLEN Career Institute is offering an NTSE Online Test Series. NTSE Online test series provides practice and mock tests for the upcoming NTSE 2019 Stage 2 exam. Our mock tests adhere to the actual exam format and allow students to perform well in the competitive exam. The topic wise content of our test series is prepared by our team of expert faculties. This particularly planned online course makes aspirants more accurate with their answers and they obtain a better grip on time management. Students can easily avail 20 tests (including 10 MAT and 10 SAT tests) for just Rs. 1200. Those who will be appearing for the NTSE 2019-2020 can subscribe to Free Mock Tests & Past Year Exam Papers from Here. ALLEN provides workshops for various national and international level exams, including NTSE, IJSP, NMTC etc. in different parts of the country where students from across the nation participate. This helps to broaden the mindset of the students to face the competition globally by enhancing their knowledge & sharpening their skills in the respective subjects and by strengthening their concepts in all subjects from an early age. Junior Science (IJSO), NMTC and other Maths/Science related Olympiads are organized by ALLEN in different parts of the country where students from across the nation participate. Click here to know more. With the help of these options, students can easily Prepare for NTSE Exam at Home. NTSE Stage 2 exam official dates have been officially declared by the NCERT. The National Talent Search Examination (NTSE) is a national level scholarship program (Exam) organized by NCERT. Through this article, we have provided complete information related to the upcoming NTSE Stage 2 exam. After the result of NTSE Stage 1 exam was declared by States/ UTs earlier this year, NCERT released the exam date for NTSE Stage 2 exam. The date of the NTSE stage 2 has now been postponed to 16th June 2019 from 12th May 2019. NCERT, Delhi has been postponed and rescheduled the NTSE Stage-2 exam date due to the upcoming 17th Lok Sabha Elections across the country. Candidates who are eligible for the NTSE Stage II will now be able to prepare for the exam with a better mindset. They will be able to utilize this time by clearing their doubts and seeking solutions for tough questions. For assistance, students can also check these important websites which will help them prepare better for the forthcoming NTSE Stage 2 examination 2019. (a) Scholarship of Rs.1250/– per month for Class-XI to XII. (b) Scholarship of Rs.2000/– per month for Undergraduates and Post-graduates. If you are still wondering from where to start preparing for NTSE Stage 2 exam, you should check these tips on how to prepare for NTSE 2019 exam. NTSE has a two-stage selection process for award of scholarship. For NTSE Stage-I, Selection is done by States/UTs through a written examination. Students, who Qualify Stage-I, are eligible to appear for Stage-II examination. A total of 755 students from various categories are declared eligible to appear in NTS Stage-2 Exam which is scheduled to be conducted on 12th May 2019. Students can check Rank & Marks in this list. Directorate of Education, Delhi has released the Delhi NTSE 2019 Stage 1 Revised Result on its Official Website. NTSE Delhi 2019 first stage Revised Result has been declared on March 19, 2019. The NTSE Delhi result 2019 has been released online for candidates who appeared for stage 1 of NTSE 2019 conducted on November 4, 2018. The selected students (Category wise) were nominated for NCERT 2nd Stage Examination. This is issued with the approval of the Competent Authority of NCERT and Directorate of Education GNCT Delhi. The result is released in the form of merit list of selected candidates. The NTSE Stage 2 Exam will be held on 16 June 2019 and the result will be declared in the second week of September 2019 respectively. NTSE 2019 stage 1 Revised Result for Andhra Pradesh has been declared! NTSE Stage-1 2019 exam was held on 4th Nov. 2018 at various centers in Andhra Pradesh State. Students who appeared for the NTSE 2019 exam and who have achieved the cutoff marks of Andhra Pradesh NTSE 2019 Stage 1 have been shortlisted for the NTSE Stage 2 examination. Now as per the recent decision taken by NCERT, “The SEAT Quota to be Doubled from 1000 to 2000” and Students can find their name in the Updated merit list below. NTSE 2019 Stage 2 Exam will be held on 16th June 2019. The admit card for the same will be released in the month of May on the official website of NCERT. State Council of Educational Research & Training (SCERT) Kerala has declared the result list of Kerala NTSE 2019. A total of 114 students have been selected to appear for NTSE Stage 2. The NTSE stage 1 exam for Kerala was held on 18 November 2018. Final Round of NTSE 2019 (Stage-II) is scheduled to be held on 12 May 2019. The Admission letter / Hall Ticket of NTSE Stage -II Examination to the recommended candidates will be auto-generated, the candidates can download the Admission letter/ Hall Ticket from the NCERT website; www.ncert.nic.in, in the month of April 2019 for appearing in the National Level Talent Search Examination.